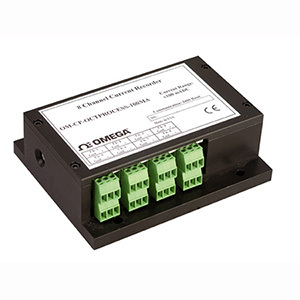 The OM-CP-OCTPROCESS is a low-cost, high-resolution, standalone data logger for automatically recording current between -20 and 120 mA. Battery powered and AC powered models are both available. It uses a 16-bit ADC to achieve a resolution of 0.01mA. In addition, the OM-CP-OCTPROCESS lets the user store user defined units in the device, as well as scale factors and offset values. This allows easy linearization and scalling allows any process meter that provides an analog output to process units. This allows easy automatic linearization and scaling of any process meter that provides an analog output to process units. This portable, easy-to-use device will measure and record up to 16,383 current measurements per channel. The OM-CP-OCTPROCESS represents a major leap in both size and performance. Its small size allows it to fit almost anywhere. Its real-time clock ensures that all data is time and date stamped. The storage medium is non-volatile solid state memory, providing maximum data security, even if the battery becomes discharged. Data retrieval is simple. Plug the logger into an available COM port and our easy-to-use software does the rest. The software converts your PC into a real-time strip chart recorder. Data can be printed in graphical or tabular format. It can also be exported to a text or Microsoft Excel file. 참고: Operator's manual and RS-232 cable are included with the OM-CP-IFC200 Windows software (software is required to operate the data logger and is sold separately). To order data loggers with optional 120 Vac power, add suffix "-AC" to model number for an additional cost.